I grew up eating this style of cookie. 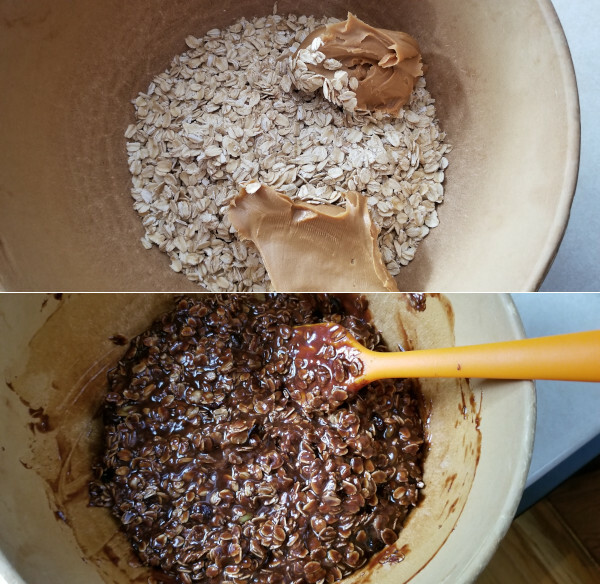 Granted my grandma made some darn good, and probably the best oatmeal cookies that I have ever eaten, but my dad of all people turned me on to these chocolate no bake cookies. I remember watching him make them, and saw excitement in making them. I know the excitement because it was essentially a no bake cookie, and one that you melted ingredients, poured into a bowl, mixed, and formed into cookies. Wait about an hour and you have treats for the week. What is not to get excited about right? I’ll admit that these cookies are not my kids favorites. They eat them, and are always curious. They are dense, which I love, and one that carries you a long way in terms of not wanting to go back in and eat three or four of them (which I also love). So I decided to whip up a batch but add in a couple of different ingredients to jazz them up a bit (not that they need jazzing). In a sauce pan, add the sugar, cocoa powder, milk and butter, and melt that down and bring to a boil. During this time, line a baking sheet with the parchment paper. Once it boils, reduce the heat to medium, and then add in your pepitas, vanilla, and craisins. Mix. To a mixing bowl add the oats and peanut butter. Pour the chocolate mixture into the mixing bowl and get stirring. Mix well, then drop a tablespoon, or larger of the mixture onto the lined baking sheet. Let these cool to harden, then grab and go. I love these, I really do. Maybe it was the history of seeing my dad’s face and that smile that he was creating something yummy back in the day, or maybe it’s because I find them just darn delicious. Whatever the case, they are part of the cookie platter in 2018, and will be on the platter as long as I’m able to make cookies. Plus, did I mention that hidden crunch from the pepitas, and that mild tartness from the craisins that make them even better?! Enjoy!